After looking at the Video documentation for all presentations at the Video Vortex Brussels conference on 5 October 2007 in Argo blogs, I am very excited to look at the new round of video vortex. 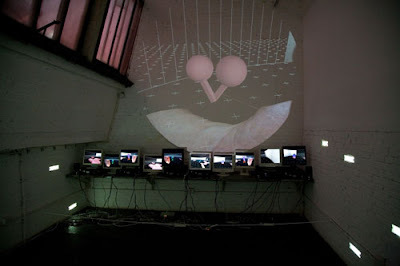 Tmr at Amsterdam,Video Vortex Conference opens. In response to the increasing potential for video to become a significant form of personal media on the Internet, this conference examines the key issues that are emerging around the independent production and distribution of online video content. What are artists and activists responses to the popularity of ‘user-generated content’ websites? Is corporate backlash imminent? After years of talk about digital conversions and crossmedia platforms we are now witnessing the merger of the Internet and television at a pace that no one predicted. For the baby boom generation, that currently forms the film and television establishment, the media organisations and conglomerates, this unfolds as a complete nightmare. Not only because of copyright issues but increasingly due to the shift of audience to vlogging and video-sharing websites as part of the development of a broader participatory culture. How are people utilising the potential to independently produce and distribute independent video content on the Internet? What are the alternatives to the proprietary standards currently being developed? What are the commercial objectives that mass media is imposing on user-generated content and video-sharing databases? What is the underlying economics of online video in the age of unlimited uploads? How autonomous are vloggers within the broader domain of mass media? How are cinema, television and video art being affected by the development of a ubiquitous online video practice? What type of aesthetic and narrative issues does the database pose for online video practice? The closing session on Saturday evening will explore the way VJs and media artists are accessing and using online archives. Under the banner of Video Slamming, this evening is all about the new ways of watching, using, and playing with moving images, such as scratching, sampling, mixing, (meta)tagging and recommending. Heard that 2008 Etech conference will have a very good art show/ fair accompaning the convention, the art fair will be organised by Brady, Kati London and Regine of WMMNA. I expect very good stuff, recommended. New/Old Routes is an exhibition and publication that explores the nomad specificity of the Islamic states after the collapse of Soviet Union. An overview of the present situation of the Central Asian context by an external viewer becomes imperative; this visual material compiled by a guest curator creates a retrospective look at the internal and evolving processes of the socio-political and cultural background. Overlapping networks and the relationship between the archaic-nomadic and the present-day post-industrial traditions provide a synthetic equation and an extraordinary cultural load. The re-use of tradition in these artists' practices become the necessary tool for articulation of contemporary art discourse to establish the nods of resistance against inertia, apathy and historical amnesia. New/Old Routes is organized as part of the Bizart/Arthub's Prince Claus Fund-the Netherlands Network Partners 2008-2010.
upcoming volume on "Situated Advocacy." information flows and disseminating strategic knowledge that influences individual behavior or opinion, corporate conduct or public policy and law? We are seeking submissions from pairs of authors, in keeping with the format of a "conversation" between two individuals or groups. Please submit a 500 word abstract and short bio for each author (150 words max) in Rich Text Format (RTF) by February 15, 2008 to editors@situatedtechnologies.net. We expect final manuscripts will range from 7500-10,000 words and will be due by May 16, 2008. Please contact us if you have questions about potential essays or the Situated Technologies Pamphlet Series in general. More information is available at http://www.situatedtechnologies.net. The Situated Technologies Pamphlet Series consists of nine short pamphlets to be published over the next three years, exploring the implications of ubiquitous computing for architecture and urbanism:how our experience of space and the choices we make within it are affected by a range of mobile, pervasive, embedded or otherwise "situated" technologies. The series, published via print-on-demand(POD), consists of a succession of "conversations" between researchers, writers and other practitioners from architecture, art, science and technology studies, comparative media study, performance studies, and engineering.